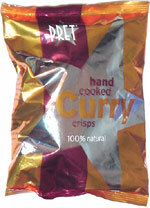 Taste test: These are good curry chips. They're very thick and crunchy, with the texture of a kettle-style chip (except much thicker than your typical one), with a good (but not at all hot) curry flavor. The chips are sufficiently thick that you can taste the potato, as well as the curry, paricularly if you eat several chips in succession. Smell test: Good, very strong curry smell.